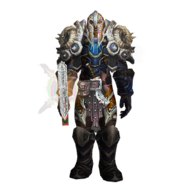 [A Challenging Look]https://www.wowhead.com/achievement=11611/a-challenging-look# ,that other people get. However I have this quest (https://www.wowhead.com/quest=45902/the-imp-mothers-gift) that's not marked as complete because I can't get the objective "Raise your weapon." Help me solve this issue please. P.S. if any proof is required in form of screenshots I can provide it. As mentioned above, you get the giant owl looking thing for then you transform into flight.